** Indian nationals residing in India. ** Students below 30 years of age. ** Graduates of a recognised university (students in the final year of a degree course and those awaiting their results are also eligible to apply). ** Students having sought admission for a postgraduate degree programme at any prestigious university for the fall intake (Those who are awaiting a decision from a university are also eligible to apply. However, the award of the scholarship is subject to them securing admission). ** For shortlisted candidates, it is mandatory for Indian nationals residing in India to attend a face to face interview. ** Applicants with Double masters and PhD aspirants can also apply for the PG scholarship. 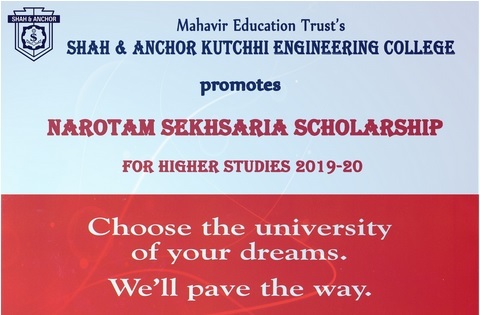 Just follow the below steps to apply for the Narotam Sekhsaria Scholarship Programme 2019. Step 1 : Go to the official website of Shah & Anchor Kutchhi Engineering College through the URL provided above. 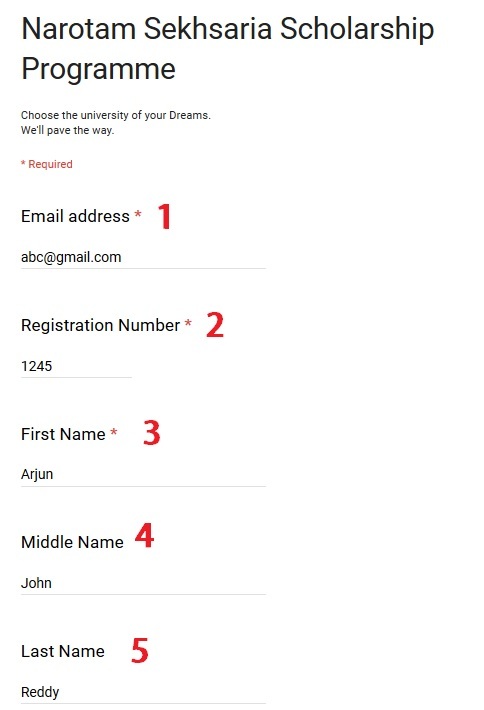 Step 2 : Next read the instructions carefully and click on “Register Now” button at the end of the page. Choose the university of your Dreams. We’ll pave the way. ** Designed for the brightest minds who wish to pursue their postgraduate studies in India and Abroad. ** Selected students to be awarded a scholarship amount of up to Rs. 20 Lakhs as per the assessment of the Foundation. ** A unique mentoring programme designed for the awardees for nurturing and assisting them in achieving their desired goals. ** Closing Date is March 27, 2019. Shah and Anchor Kutchhi Engineering College was established in 1985 for the purpose of imparting quality technical education. The college is managed by Mahavir Education Trust. The college is approved by AICTE, New Delhi and Government of Maharashtra, and is affiliated to University of Mumbai. It also has an ISO -9001 Certification. It offers under graduate courses in Computer Engineering, Information Technology, Electronics Engineering and Electronics & Telecommunication Engineering. It has started an extra division in Computer Engineering for Diploma Students.